"If we harbor thoughts of violence or hatred, or seek revenge or retribution, we are contributing to the wounding of the world; if we transform those thoughts into forgiveness and compassion, and then move beyond them to actually make amends or restitution, we are contributing to the healing of the world. This timely, powerful and compassionate book helps show us the way." "Nothing will help us survive the present age more than breaking the tragic cycles of violence and revenge that threaten our very existence. 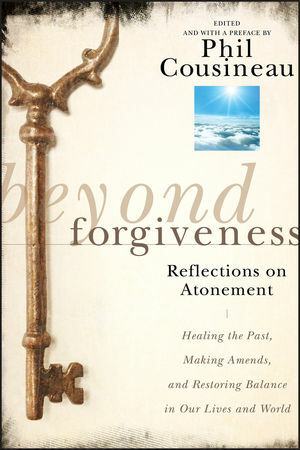 To do so, we must honor our soul's desire for deeper forms of reconciliation, a process that Phil Cousineau reveals here as being on the other side of forgiveness, in the ancient ritual of atonement. His book is a profoundly important contribution to the healing of the world, and I give it my blessing." As indispensable as forgiveness has been to the healing process throughout history, there is another equally profound action that is needed for ultimate reconciliation, which Arun Gandhi, grandson of Mohandas Gandhi, calls “the other side of the coin.” Turning over the coin of forgiveness, we discover atonement, the half-hidden, much-overlooked other half of the reconciliation process. Beyond Forgiveness shows how acts of atonement—making amends, providing restitution, restoring balance—can relieve us of the pain of the past and give us a hopeful future. This rich and powerful book includes 15 thoughtful contributions by high-profile thinkers and activists including Huston Smith, Michael Bernard Beckwith, Azim Khamisa, Rabbi Michael Lerner, Jacob Needleman, Michael Nagler, Diane Hennacy Powell, James O’Dea, Arun Gandhi, Kate Dahlstedt, Ed Tick, Richard J. Meyer, Rev. Heng Sure, Douglas George-Kanentiio and Katharine Dever. Atonement is put forward as a process that we must all learn to practice—from individuals to nations—if we are to heal our wounds and move forward. Phil Cousineau is an award-winning writer and filmmaker, editor and lecturer, cultural observer and TV host. He has published twenty-six nonfiction books, written fifteen documentary films, and is currently the host and co-writer of Global Spirit on Link TV. Learn more at www.beyondforgiveness.org. Foreword: Atonement as a Spiritual Path (Huston Smith). Preface: The Next Step in Forgiveness and Healing (Phil Cousineau). Introduction: The Revival of an Ancient Awareness (Richard J. Meyer). PART ONE Forgiveness and Beyond. 1 Forgiveness as Spiritual Liberation (Michael Bernard Beckwith). 2 The Wisdom of Atonement (Jacob Needleman). 3 We Can Work It Out: Heart, Mind, and Action in the Struggle for Atonement (Michael N. Nagler). 4 At-One-Ment: Becoming Whole (Diane Hennacy Powell). 5 Burying the Stone: Rituals and Ceremonies of Atonement (Kate Dahlstedt). 6 Taking the Crucial Step: Forgiving the Other and Forgiving Yourself (Katharine Dever). 7 A Twelve-Step Approach to Atonement (Anonymous). PART TWO Stories of Atonement. 8 Memories of My Grandfather: Atonement the Gandhi Way (Arun Gandhi). 9 Healing the Wounds of War: Atonement Practices for Veterans (Edward Tick). 10 After the Death of My Son: My Journey of Forgiveness and Atonement (Azim Noordin Khamisa). 11 Ten Days of Atonement (Rabbi Michael Lerner). 12 The Iroquois Great Law of Peace: Atonement Among the Haudenosaunee (Douglas M. George-Kanentiio). 13 Talkin' 'bout My Generation: The New Face of Atonement (Stephanie N. Van Hook). 14 Buddhist Bowing and Atonement (Reverend Heng Sure). Conclusion: Creative Atonement in a Time of Peril (James O'Dea).